300g self-raising flour, 50g cocoa powder, 300g brown sugar, ½ tsp salt, 480ml water, 60ml vegetable oil, 2 tbsp vinegar, 2 tsp vanilla extract. Preheat oven to 180°C. Sift self-raising flour and cocoa powder. Mix in a large bowl with brown sugar and salt. Make a well in the centre and add water, vegetable oil, vinegar and vanilla extract. Mix well with a wooden spoon until smooth. Transfer mixture to a 20cm/8inch cake tin. 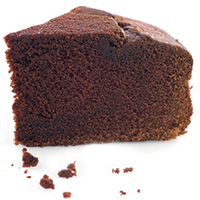 Bake for approximately 45 mins or until skewer inserted into centre of cake comes out clean. 300g caster sugar, 300g butter, 6 eggs, 300g gluten free self-raising flour, 3 tsp gluten free baking powder, 2 tbsp hot water, 2 tbsp instant coffee, 1 tsp vanilla paste. Preheat oven at 160°C. Grease and line 2 x 20cm cake tins. 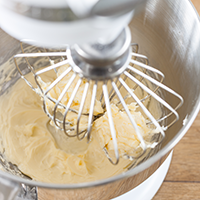 Whisk sugar and butter until fluffy and a pale cream. Separately whisk the eggs and gradually add to the mixture. Sift baking powder and flour together, and gradually fold into the mixture. Dissolve the coffee and vanilla paste in the hot water and add to mixture still folding. Pour into cake tins and bake for 30 mins.